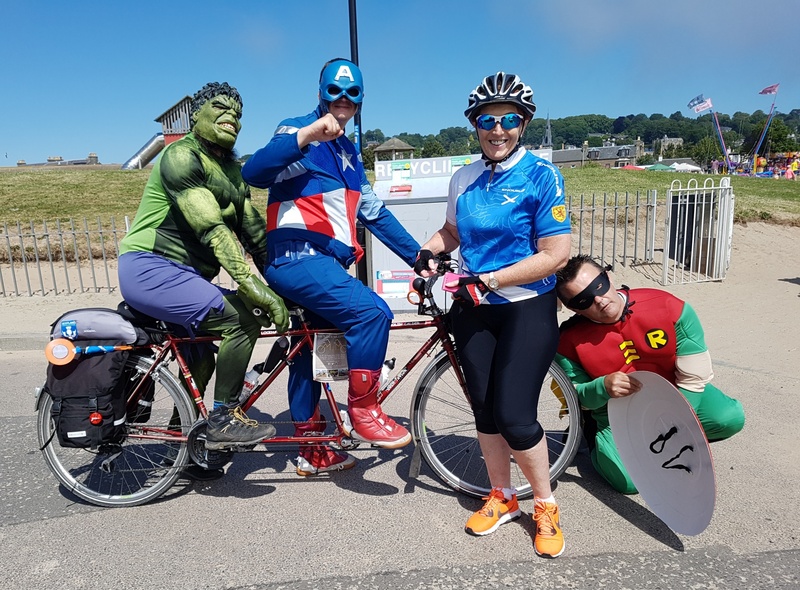 It’s not everyday I get to meet up with three Superheroes at Broughty Ferry! 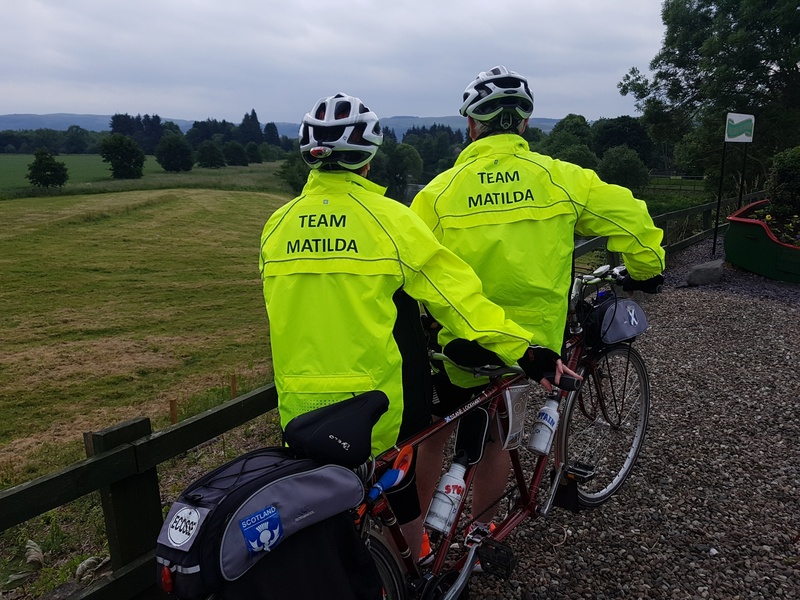 Meeting superheroes and penguins – well I suppose it shouldn’t surprise me as I should be well used to such strange happenings on another typical Sunday #tandem ride for Team Matildas Musings! 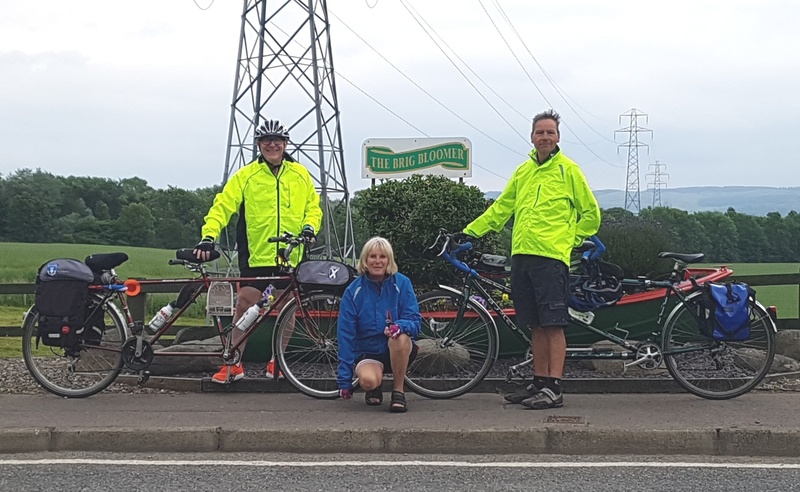 Sunday morning dawned with fabulous blue skies so my dynamic crew decided on a route from the Tay Road Bridge to Arbroath on Sustrans Scotland NCN Rt1. And as an added attraction the “old git” decided that we would do some penguin spotting by p-p-p-p-icking up a penguin … or two … on the new Maggie’s Penguin Parade charity art trail and spotting some of the 80 giant individually designed penguins! 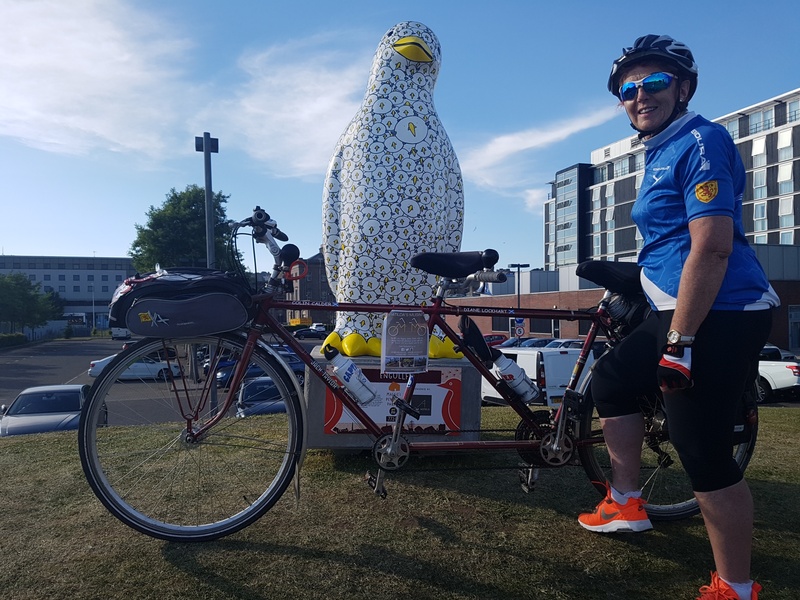 The 5ft-tall penguins have been decorated by local artists with designs ranging from golfers to footballers and has been set up in aid of cancer charity Maggie’s. 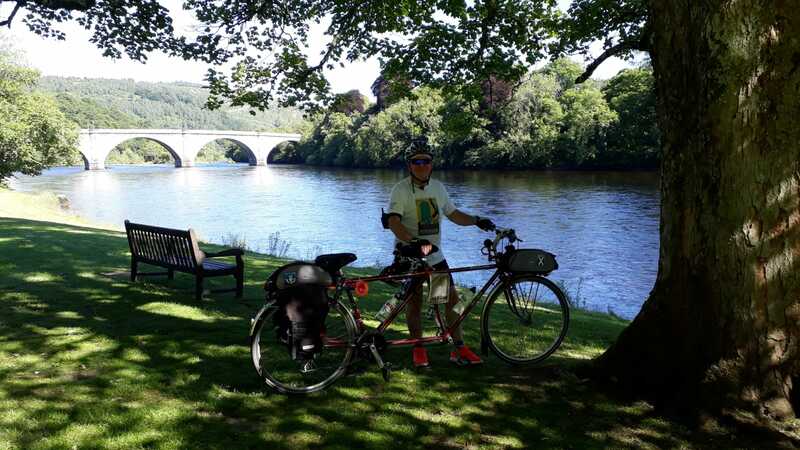 After parking up opposite the city of Dundee a quick “downhill” pedal took us across the Tay Road Bridge, before heading through the port area and on up the coast to Broughty Ferry. That’s where we ticked off our first penguin – appropriately called Crystal Azure given the weather conditions. 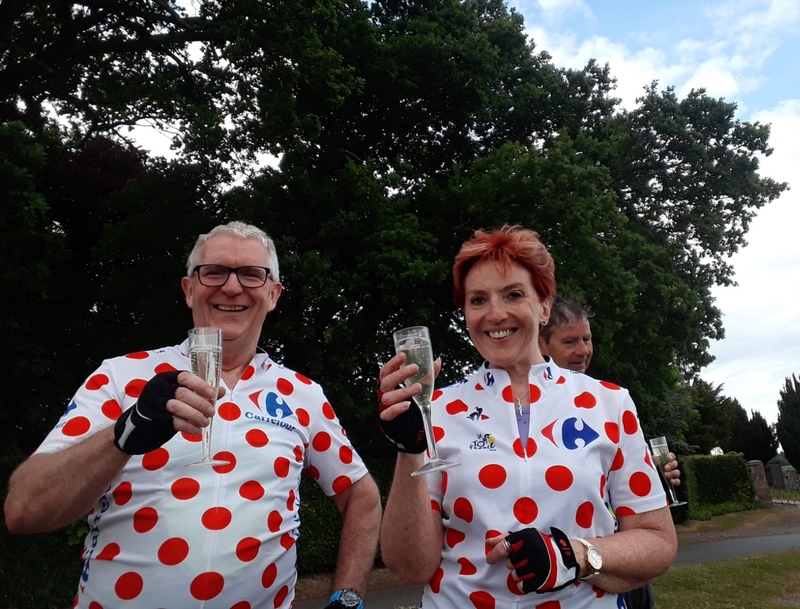 Matching outfits (nearly!) The “old gal” ticks off our first penguin – Crystal Azure at Broughty Ferry. 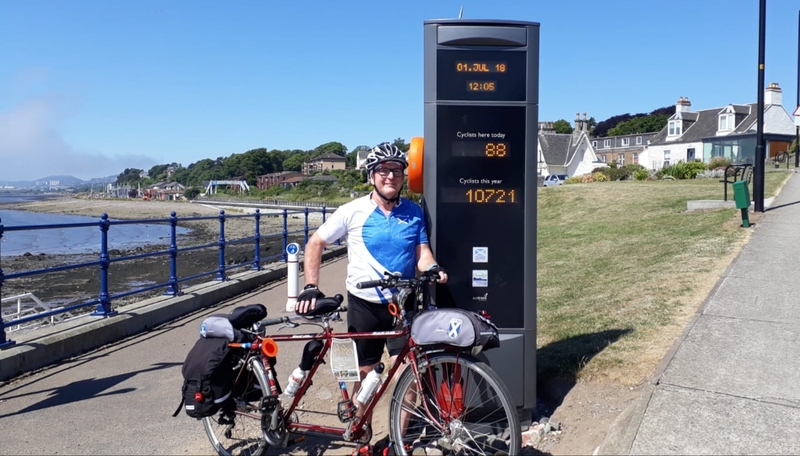 Just beside our first penguin photo stop, we spotted a Sustrans Scotland “high-visiblity” cycle counter which has been installed at the east end of Douglas Terrace path along the waterfront and will provide a visual counter of the number of cyclists using the route. 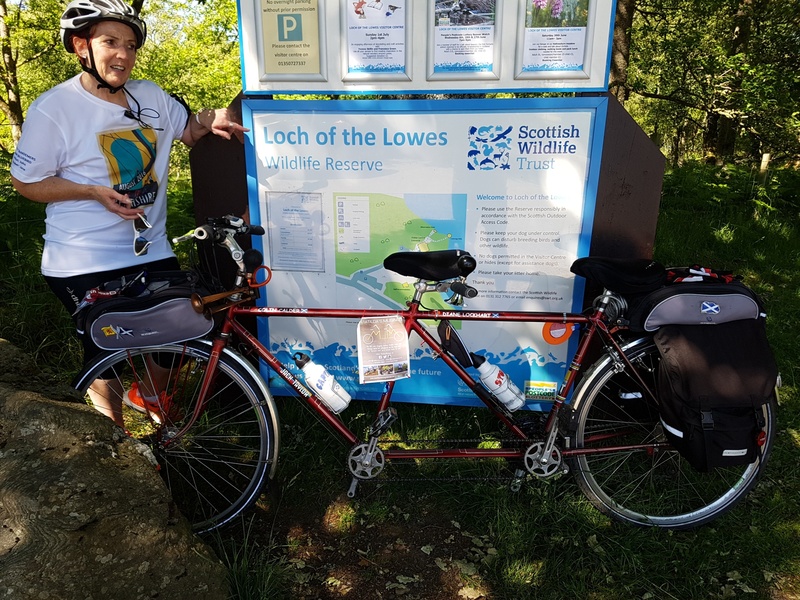 Sustrans says the idea behind cycle counters is to promote sustainable transport such as walking and cycling instead of driving. 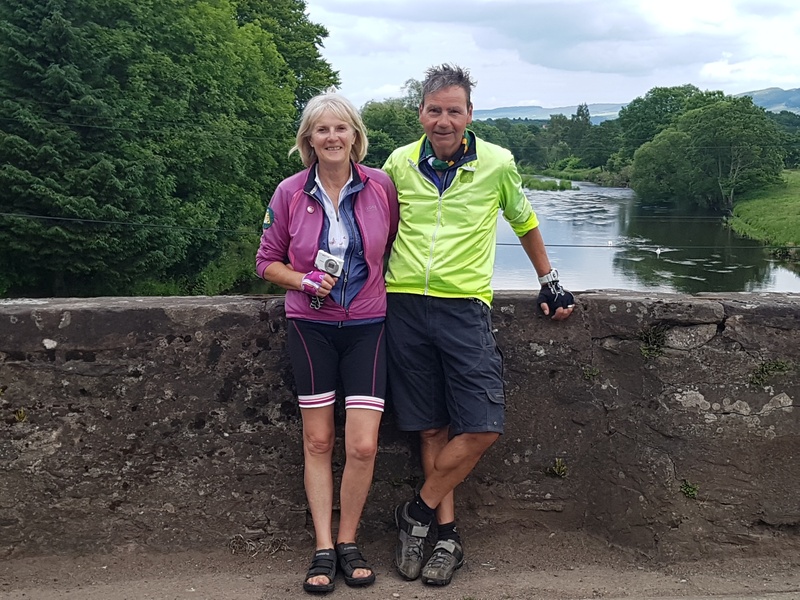 In general, cycle counters have been shown to be motivational for cyclists and provide data that assists planning for cycling infrastructure. 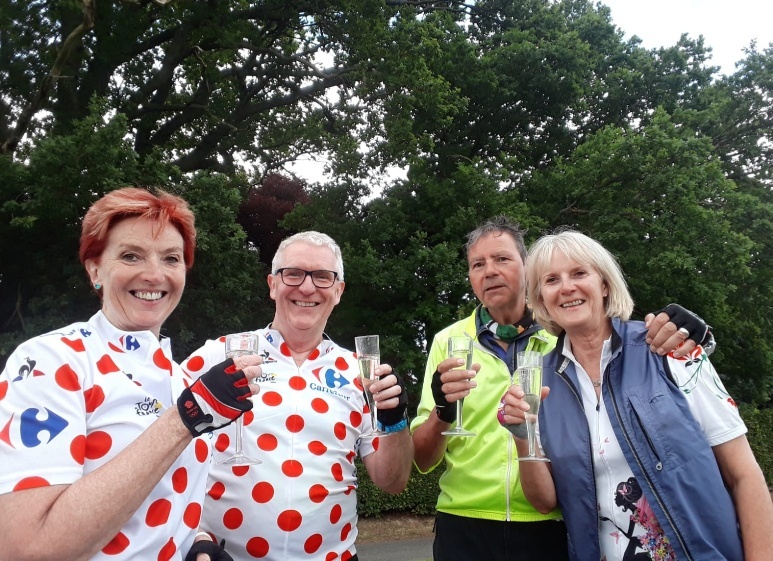 What a great idea … and Team Matilda was happy to be recorded as the 88th cyclist to be recorded that day – and number 10,721 since the counter was installed at the start of June this year. 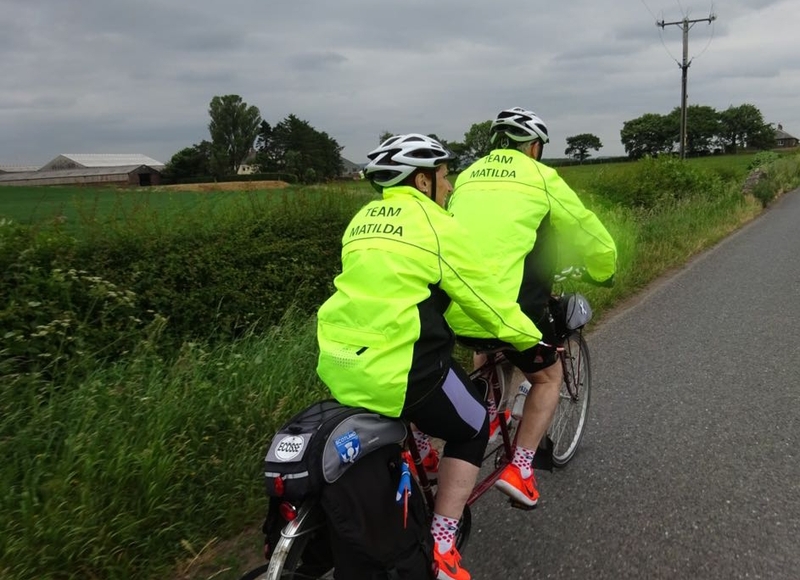 And yes we only increased the counter by one unit – not two – as it counts the bikes not the riders! What a great idea! 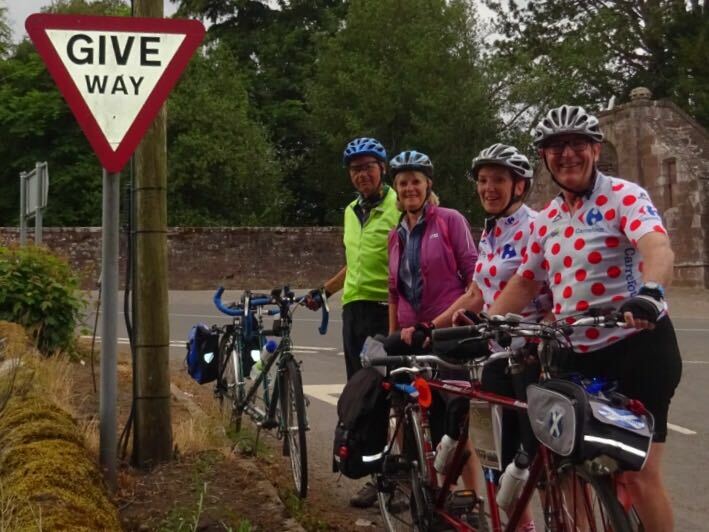 The Sustrans Scotland cyclists counter shows how busy NCN Rt1 is. The “old gal” couldn’t fail to be impressed with her new pals – Hulk, Captain America and Robin. 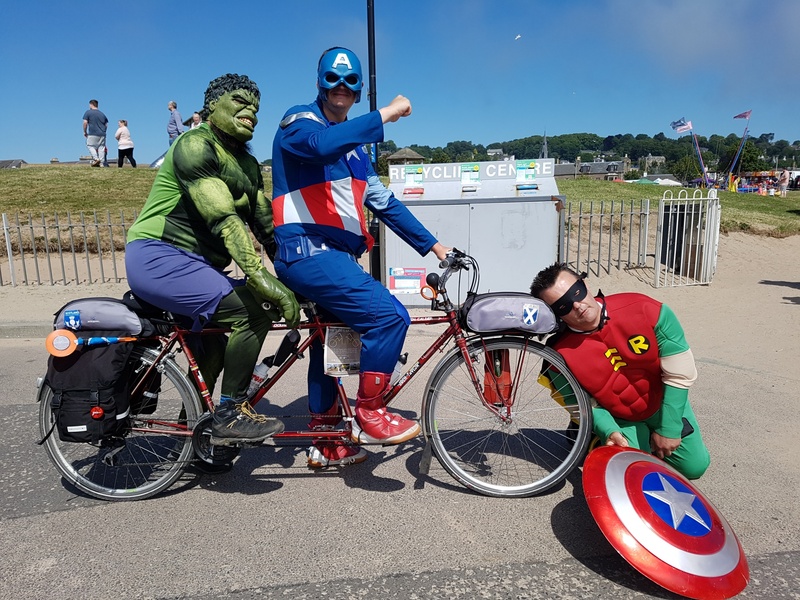 Having safely delivered the Superheroes to the Gala Day – as you do! 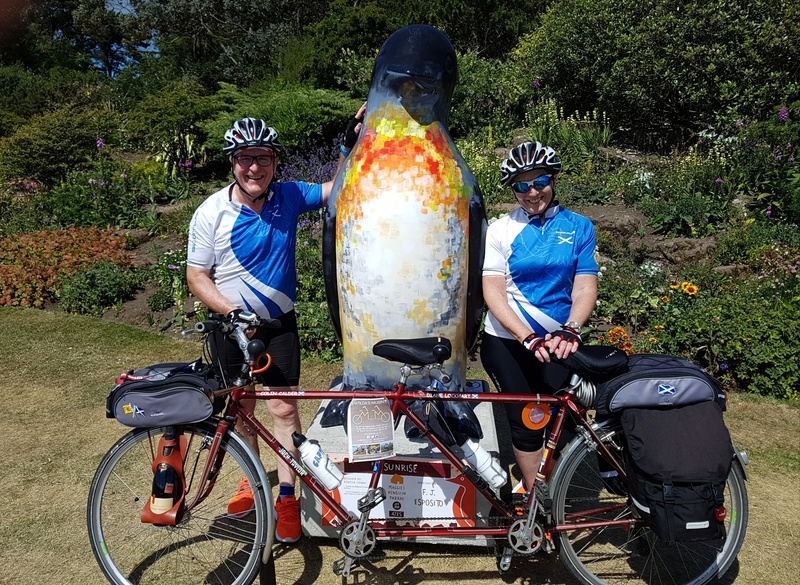 – we pedaled on to our next stop on the trail – a penguin called Sunrise who was enjoying the sunshine in Barnhill Rock Garden situated just behind the dunes of the beach. My dynamic crew meet Sunrise penguin just behind Broughty ferry beach. 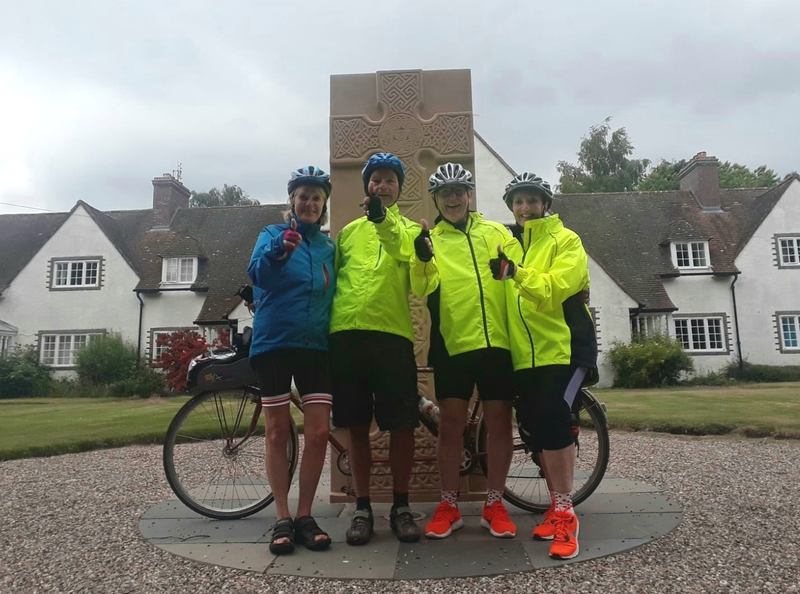 My dynamic crew tandemed on to Carnoustie where preparations were in the final stages for hosting the 147th The Open which was played over the Carnoustie links golf course in July. It has a well-deserved reputation as one of the world’s most challenging links course, and at 7,421 yards it is the longest of any of the Open venues. The course was looking resplendent in the sun and I took the opportunity of a sneeky photo in front of the area for the world’s top golfers to practice their putting. Naturally the golf course is host to a penguin – Old Tom Morris named after the legendary Scots golfer who won The Open four times back in the 1860s. 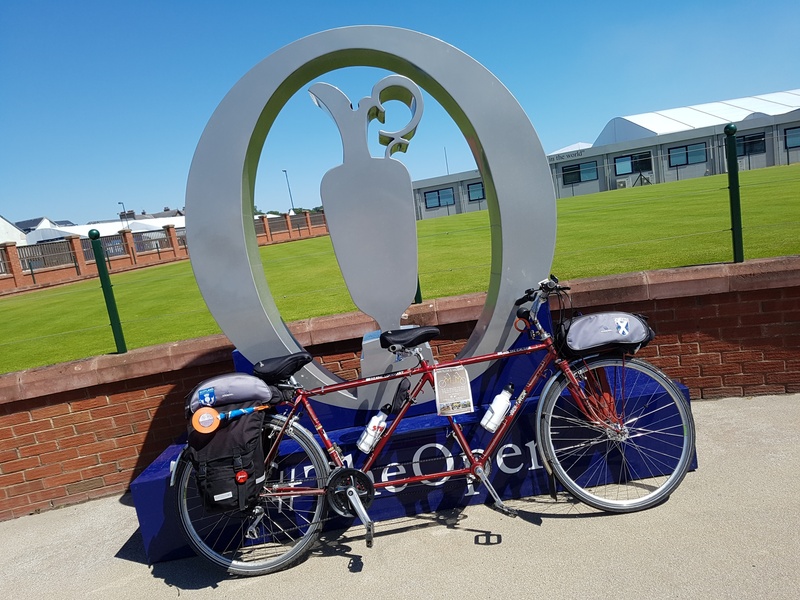 At Carnoustie Golf Links – looking resplendent in the sun ready for the 147th The Open. 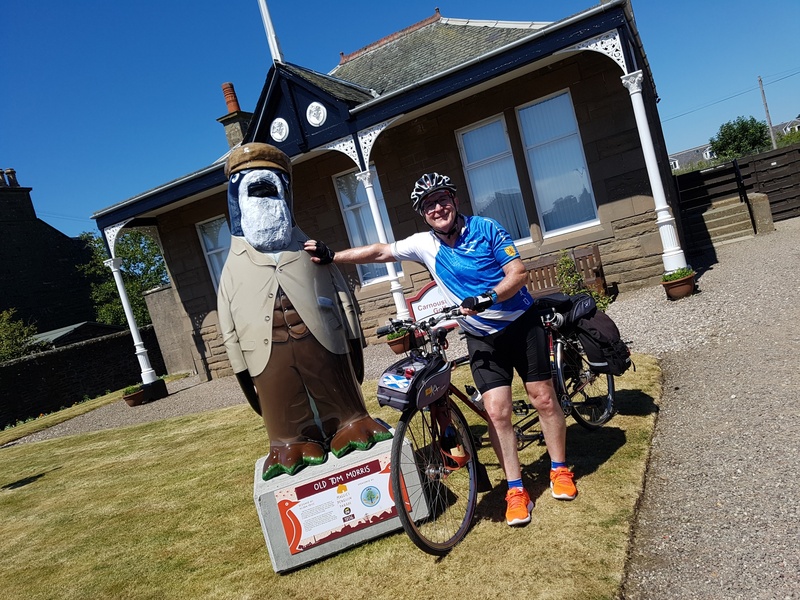 The “old git” meets Old Tom Morris penguin at Carnoustie Golf Links. 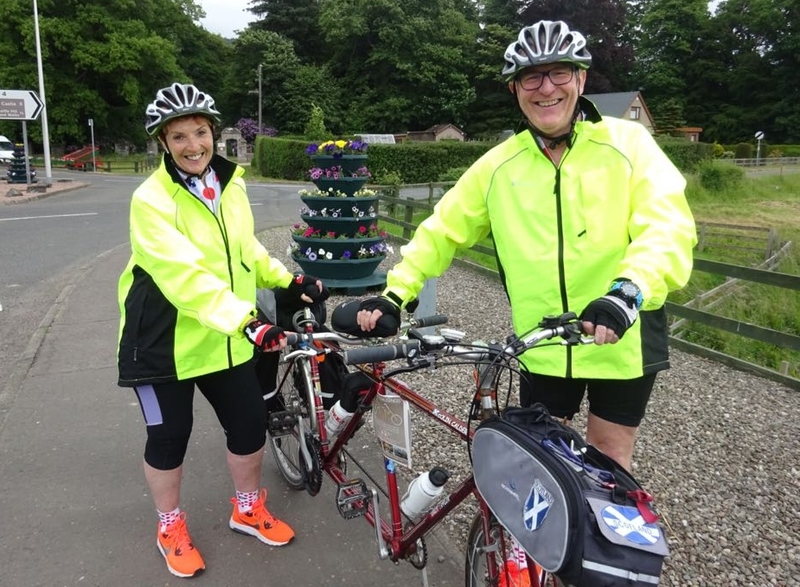 Now the “old gal” and the “old git” have never progressed further than Carnoustie – despite doing this ride a few times. 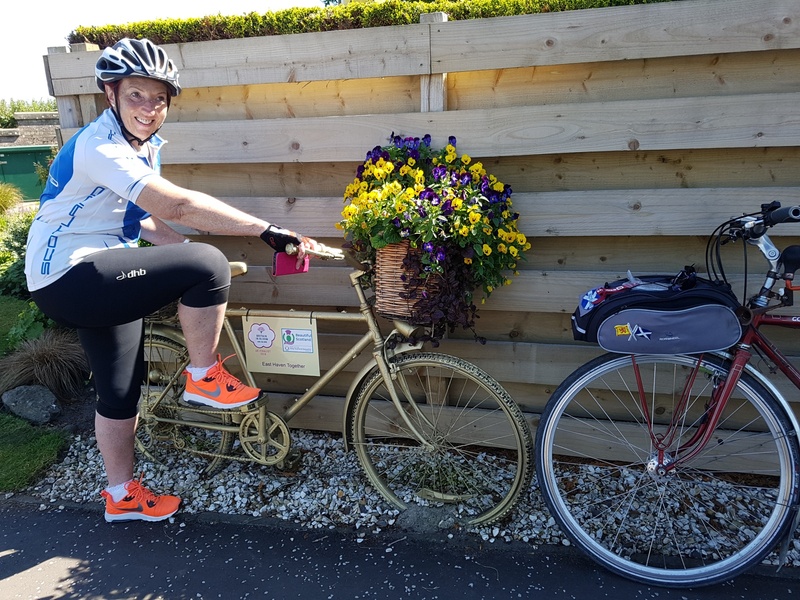 But today, conditions couldn’t be better and my dynamic crew decided to pedal out on the extra seven miles along NCN Rt1 to Arbroath. And what a joy that section of the cycle path was to pedal on. The harbour town was looking a its best in the bright sunshine and was busy with families enjoying the beach giving it an almost Mediterranean feel. 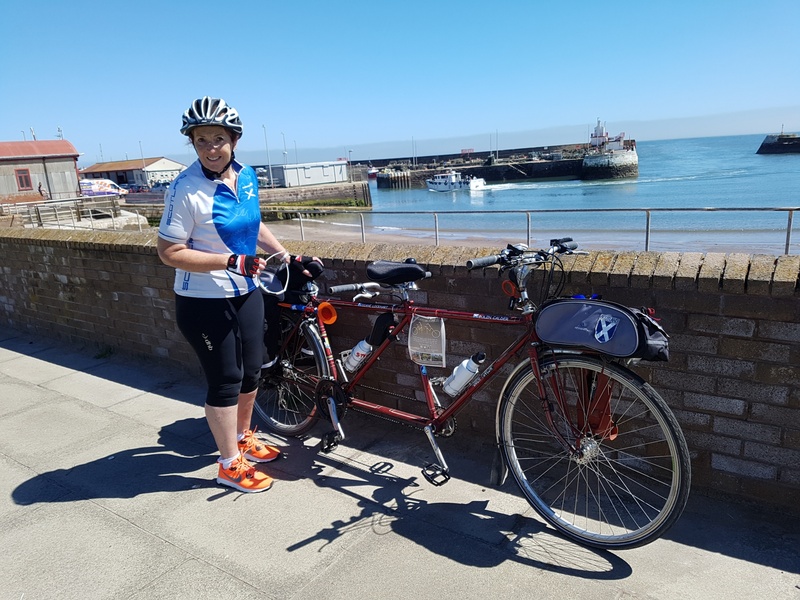 It was the warmest part of the day when Team Matilda arrived at the harbour area at Arbroath. 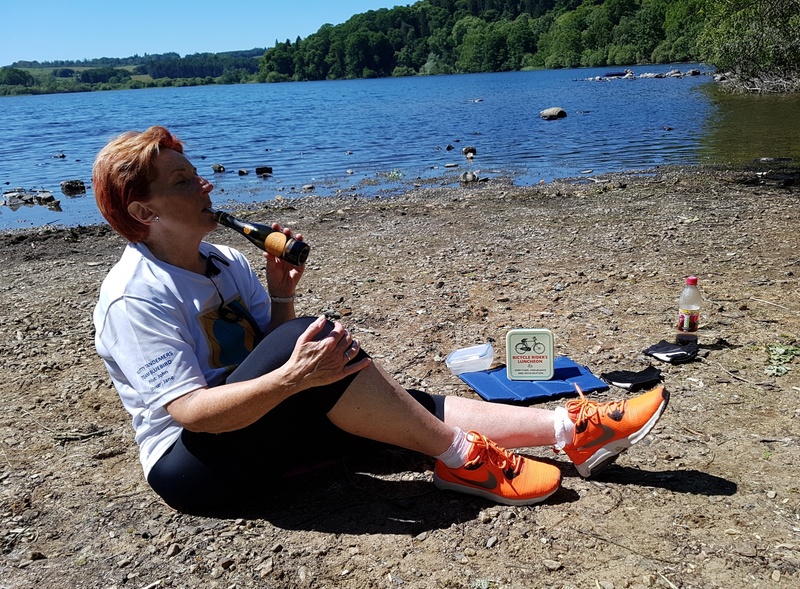 The “old gal” spotted some picnic benches on the High Common which gave a great view over the beach and sea and the perfect spot for my dynamic crew to enjoy one of their signature prosecco picnics! 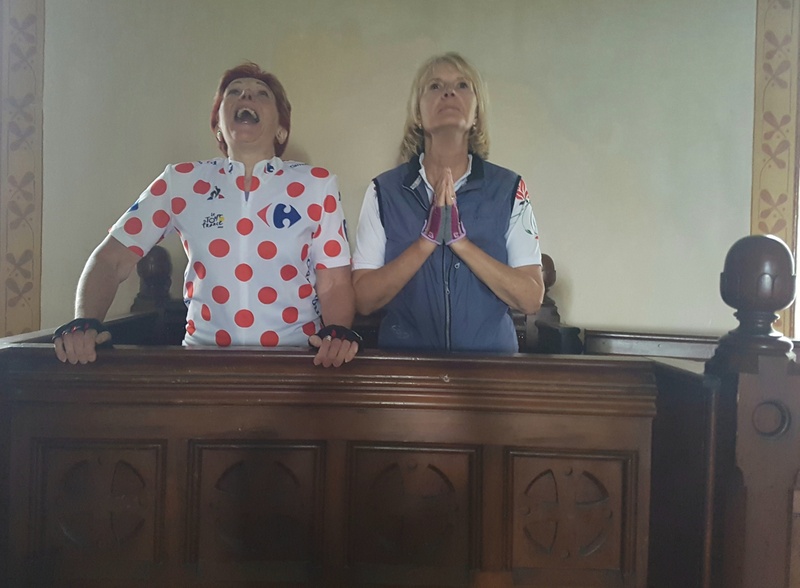 And I am told the fizz went down particularly well given the high temperatures! 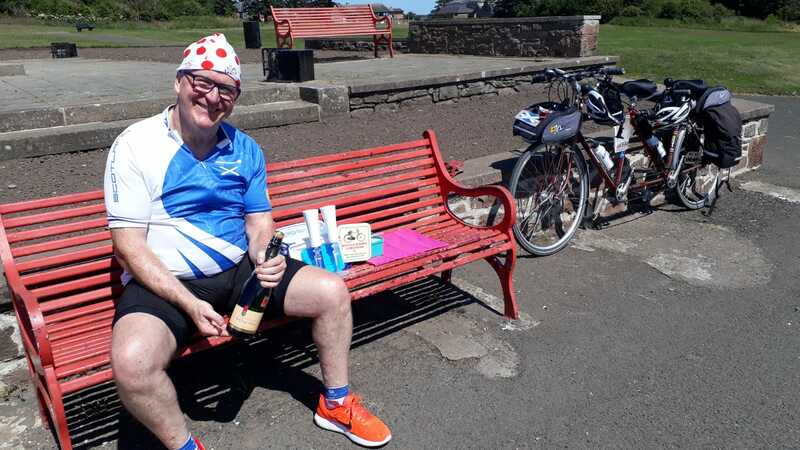 A park bench overlooking the sea – perfect spot for my dynamic crew’s prosecco picnic! 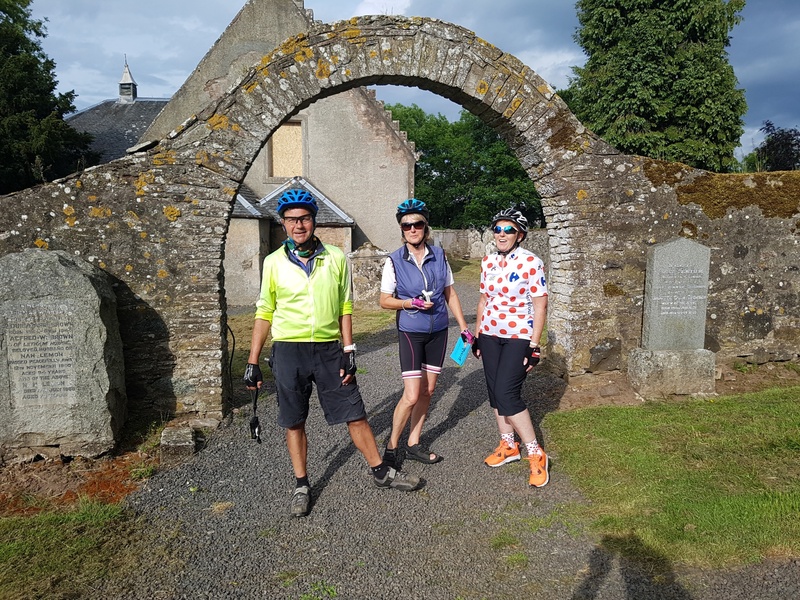 Refuelled after a most relaxing and tasty picnic, and catching the sun’s rays, my dynamic crew set off from Arbroath on the return journey along NCN Rt1. 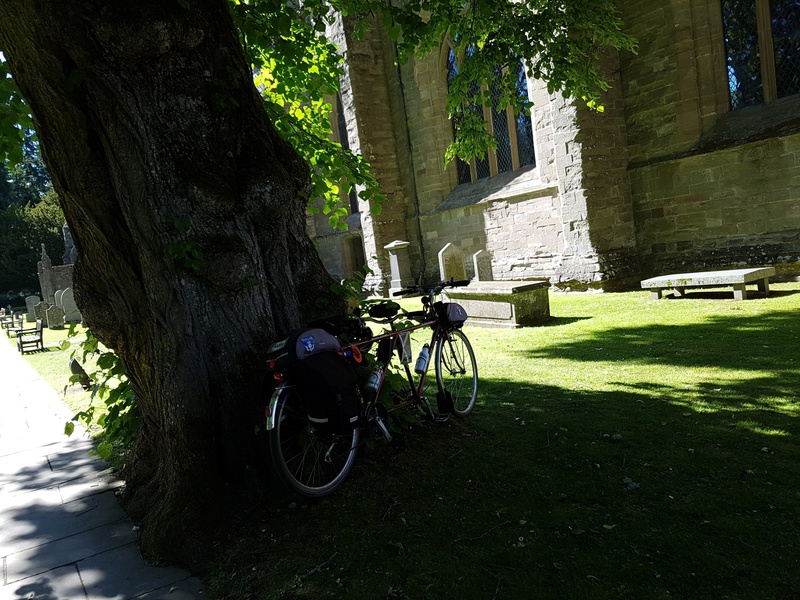 It was great to see the path being so well used by bicycles on such a sunny day. 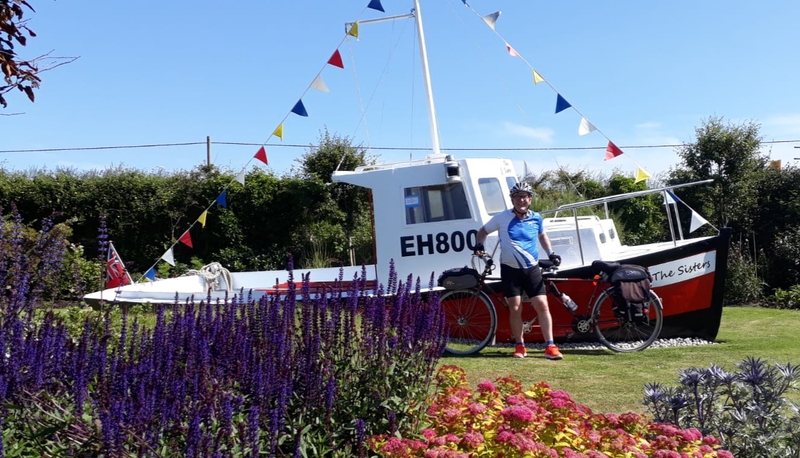 It was a fun ride and soon we were in the beautiful former fishing village of East Haven which clearly has a highly active community trust called East Haven Together to protect and promote the area’s heritage and environment. 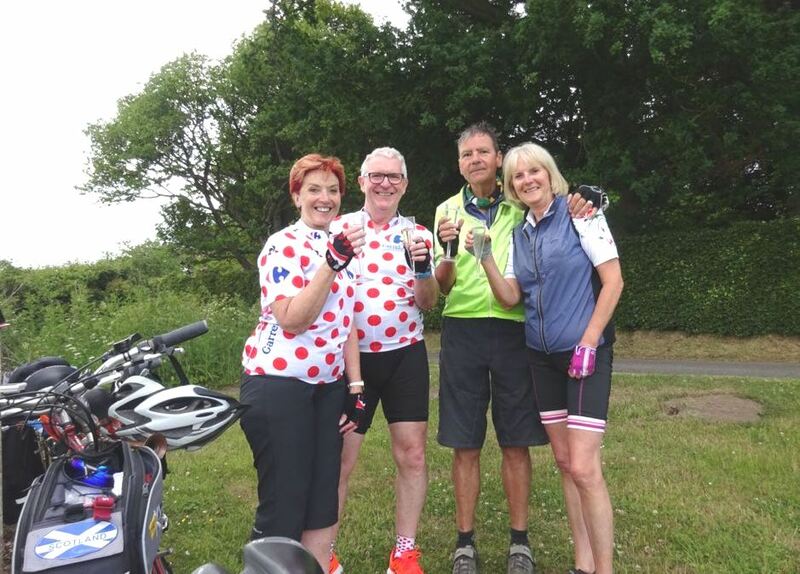 And cyclists are made most welcome! The “old gal” seems temporarily confused as to which bike she should be riding at East Haven! 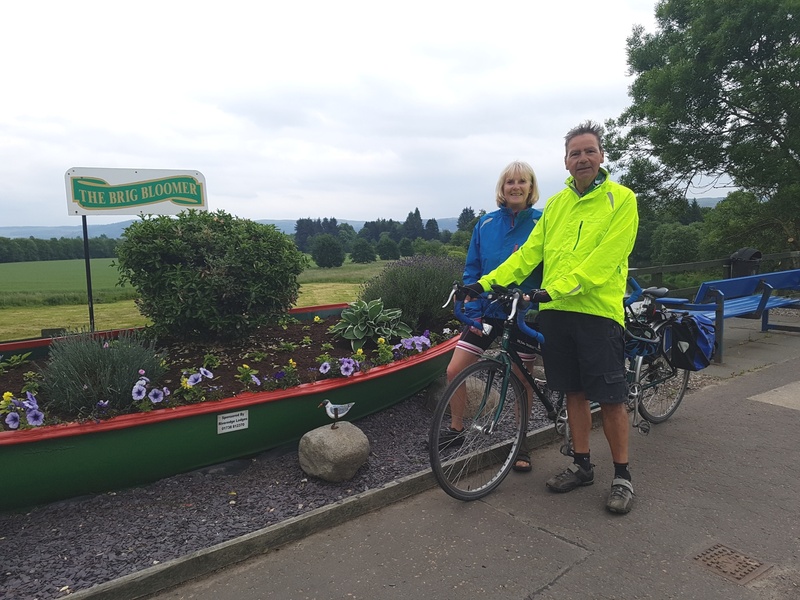 East Haven is one of five locations in Scotland to have been entered into the Britain in Bloom finals 2018 – and it was easy for the “old git” and “old gal” to see why as they stopped to admire the colourful community gardens – complete with a fishing boat. Last year the area won a Beautiful Scotland Gold Award 2017 and Best Coastal Village Award. The “old git” enjoying the scene in the award-winning picturesque garden at East Haven. 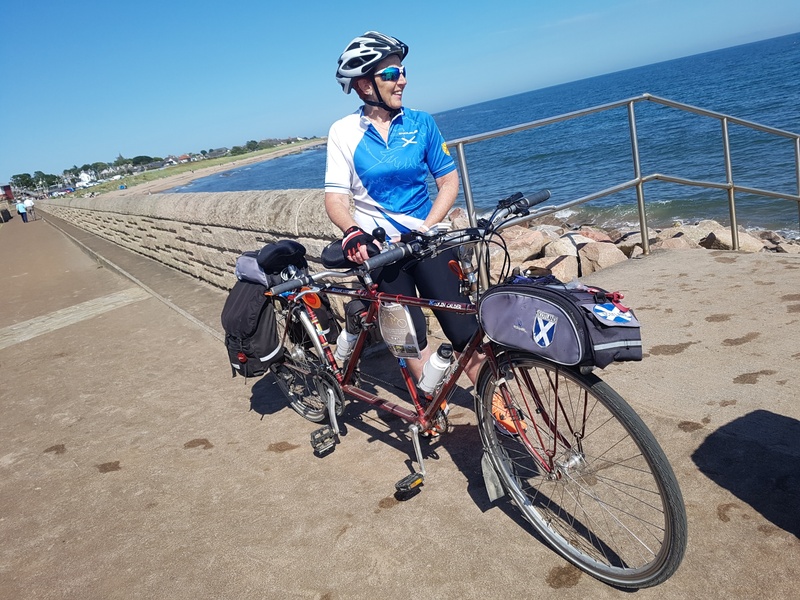 Back into Carnoustie and time for a photo stop by the beach – where the sea was actually blue! Quite a contrast to my dynamic crew’s last visit in March when it was not exactly sunbathing weather! 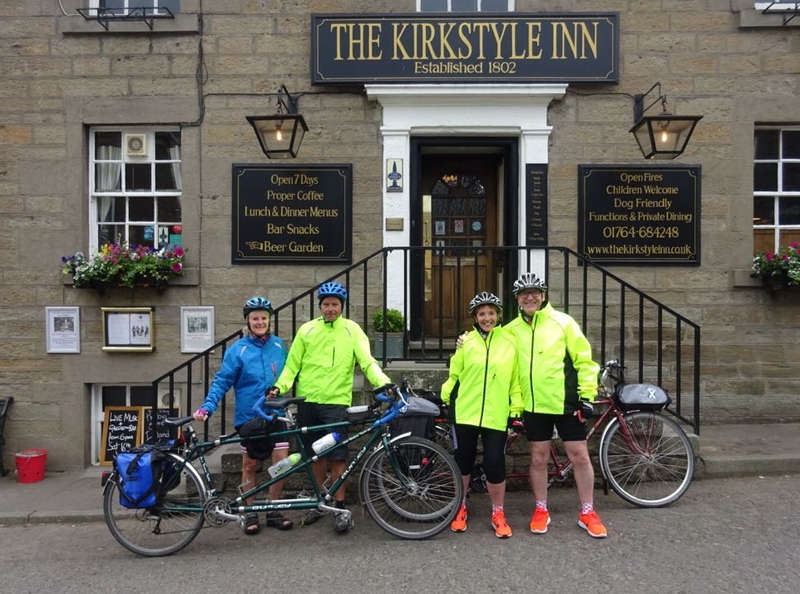 In fact the “old gal” was so cold she had to wear not only her own cycling jacket, but the “old git’s” as well in a bid to try and keep warm! The “old gal” enjoying it being a tad warmer – and less windy – than on our last visit to Carnoustie! 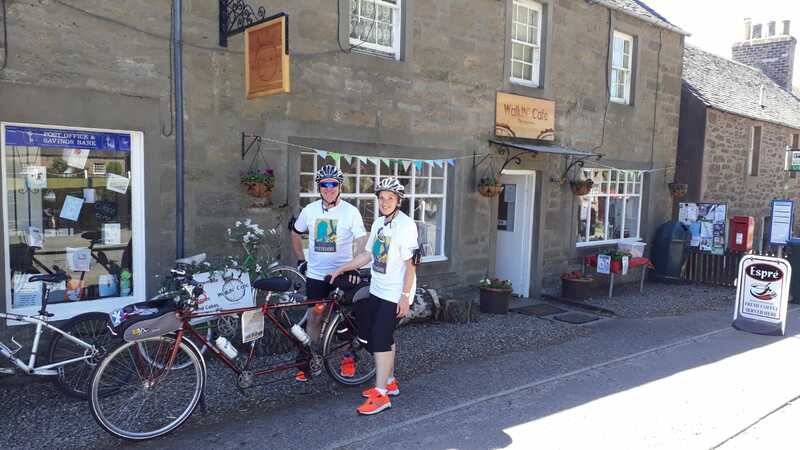 No such weather problems today and a glorious sunny pedal took us along the coast for another signature event of Team Matilda’s rides – a re-fuelling stop for carrot cake! The venue was the Glass Pavilion situated just behind Broughty Ferry beach. 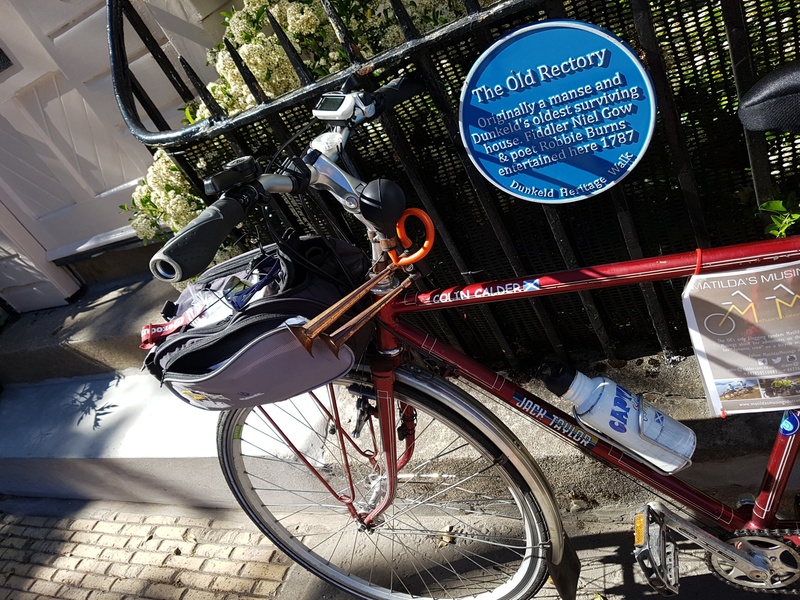 As we stopped the “old git” discovered that he had left his cycling wallet – complete with the required cash for said carrot cake – in Matilda Transport. 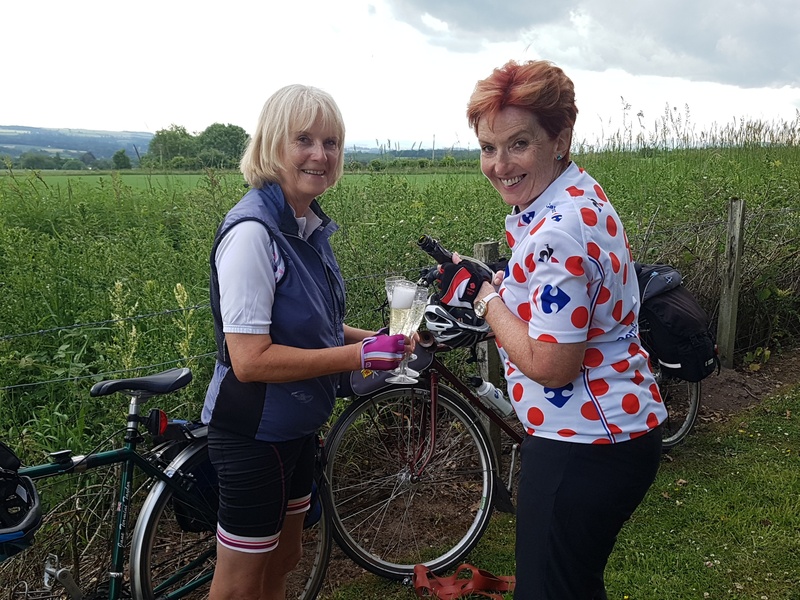 Fortunately the ever-resourceful “old gal” had a small amount of cash with her and they just managed to fund a cold drink each and share a portion of carrot cake! I have a feeling that the “old git” will not be allowed to forget about that one for a while! The “old git” meets Bonnie Dundee penguin. 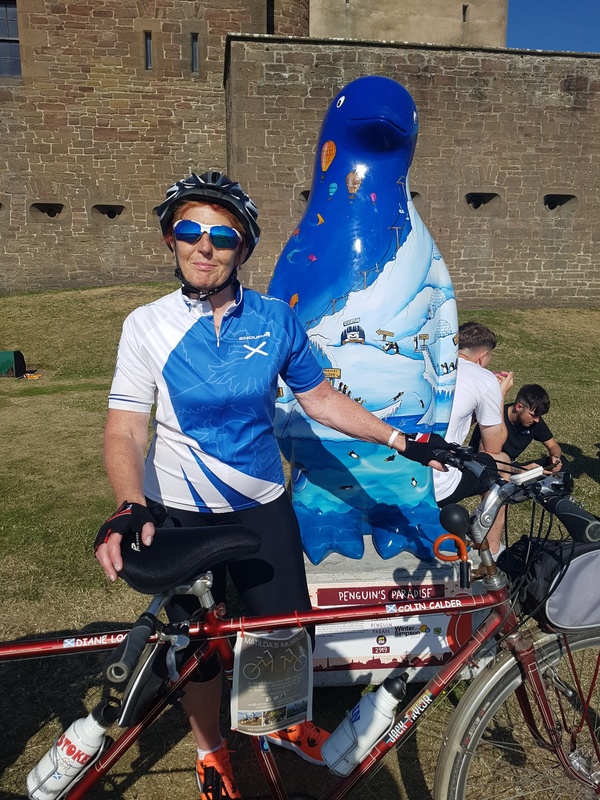 Back into Broughty Ferry – and the “old gal” was disappointed not to see her new Superhero friends again! But there was more penguin spotting to be done including the Bonnie Dundee one in the park. 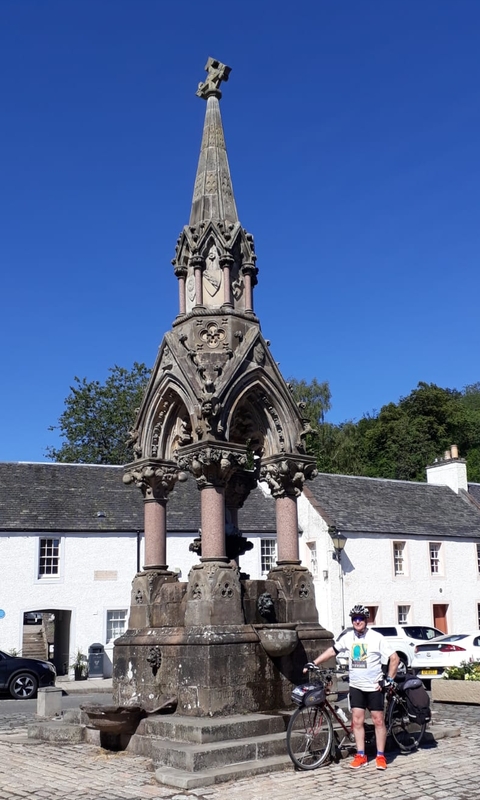 We discovered this one had actually been painted by talented artist Gail Stirling Robertson – who lives not far from Team Matilda’s home base of Auchterarder in the next village of Dunning and who is also the daughter of friends of my dynamic crew. Gail focuses on what she calls “quirky bendy art” – taking well known places and literally adding her own slant to them, while still keeping them recognizable. 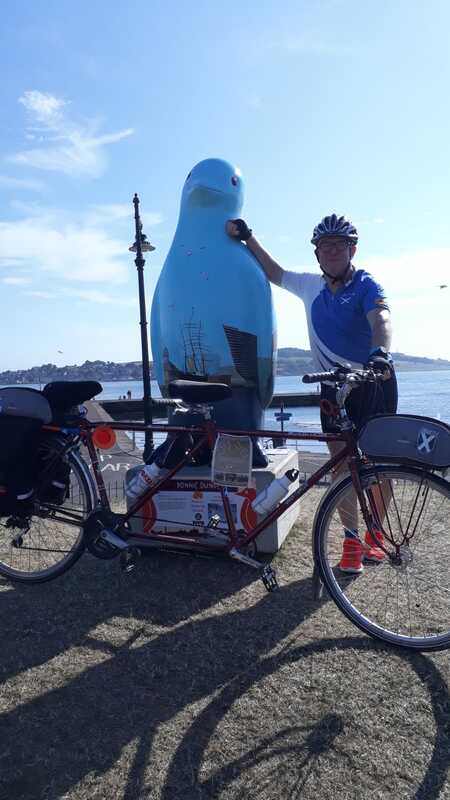 Capguin Scott penguin getting to know the “old git” at Brought Ferry Harbour. 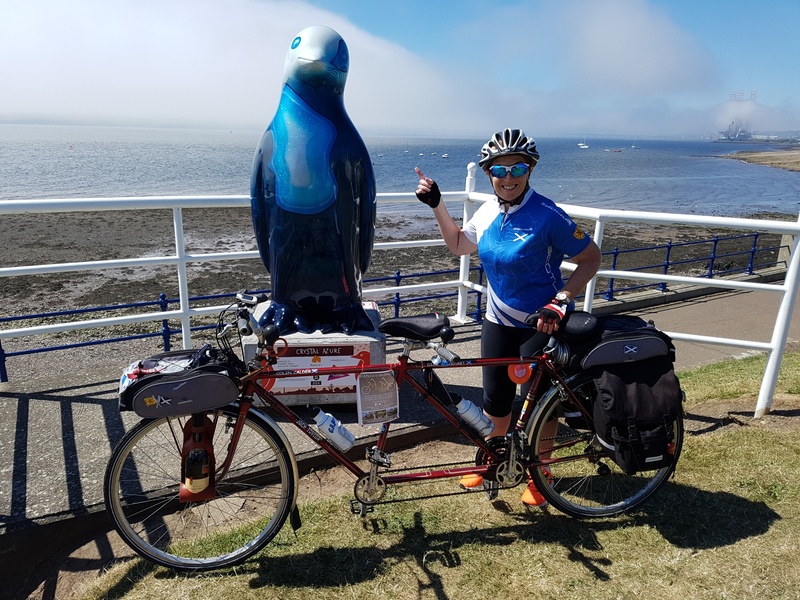 After ticking another two penguins off the list – Penguin’s Paradise at Broughty Ferry Castle and Capguin Scott at the harbour – we tandemed off on the final stretch to Dundee. 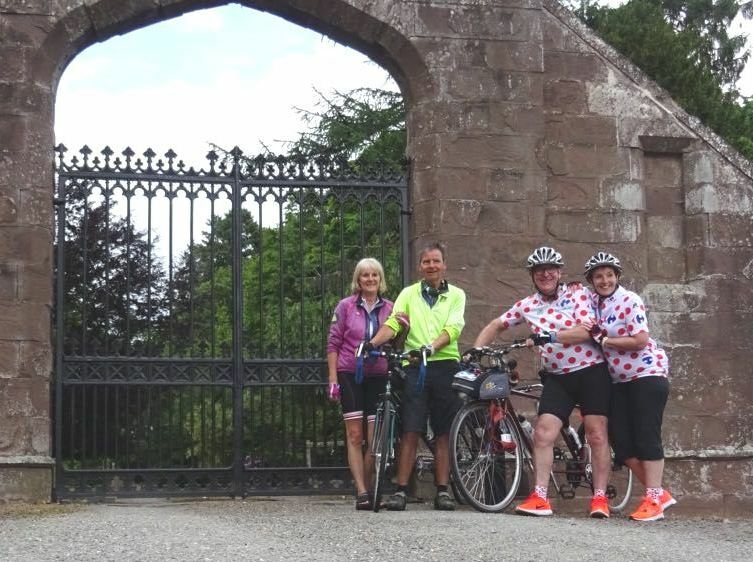 In the shadows of the Tay Road Bridge, near the Apex Hotel, we found the last one of our ride – called Engulfed. 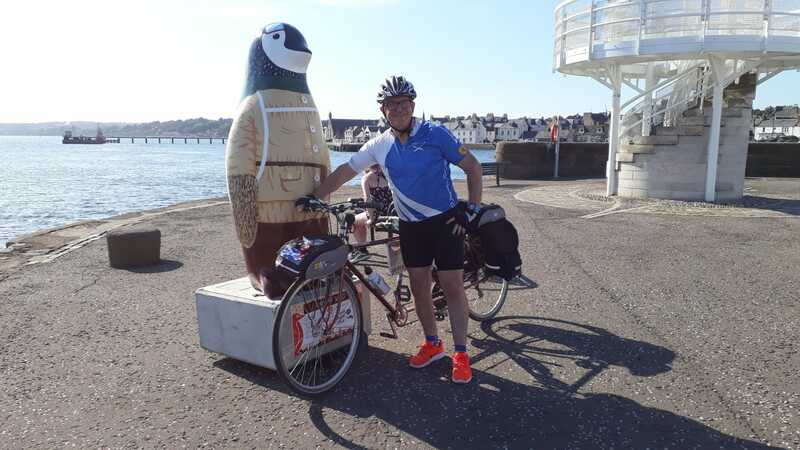 The last penguin meet – Engulfed at the Apex Hotel near the Tay Road Bridge. 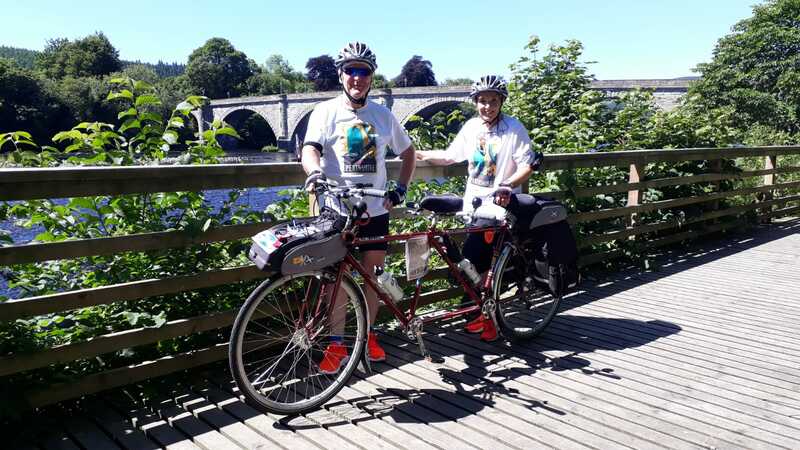 The last part of our ride was the “uphill” crossing of the Tay Road Bridge – which always seems a bit of a grind. 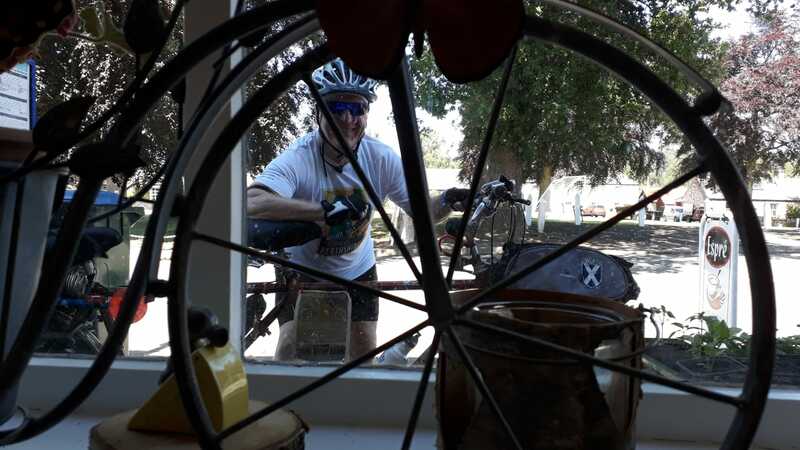 Back at Matilda Transport there was time for the “old git” to check Strava which officially recorded the ride as being worthy of no less than 19 gongs – a highly pleasing 12 personal bests; 5 second bests; and 2 third bests. 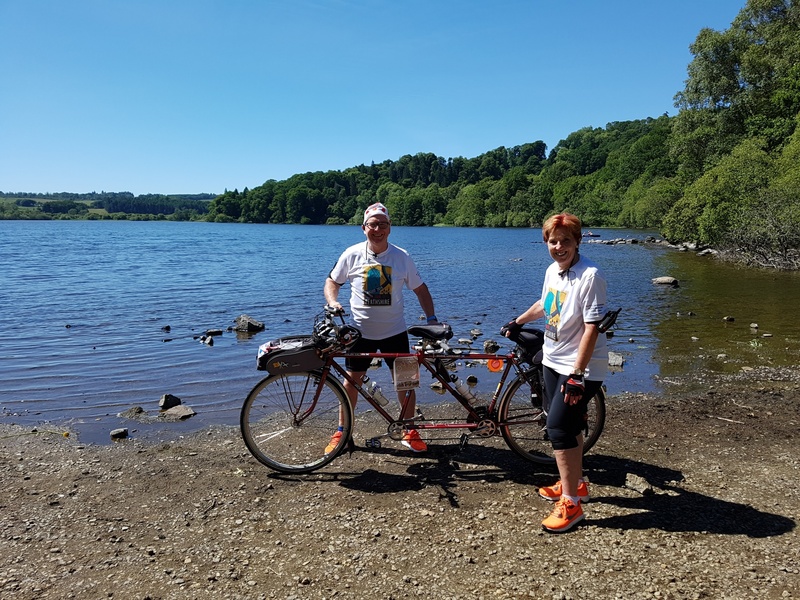 My dynamic crew were delighted to discover that one of the PB’s was for the “Killer Tay Bridge” segment on the return crossing with a new Team Matilda record breaking time of 6 minutes 46 seconds! 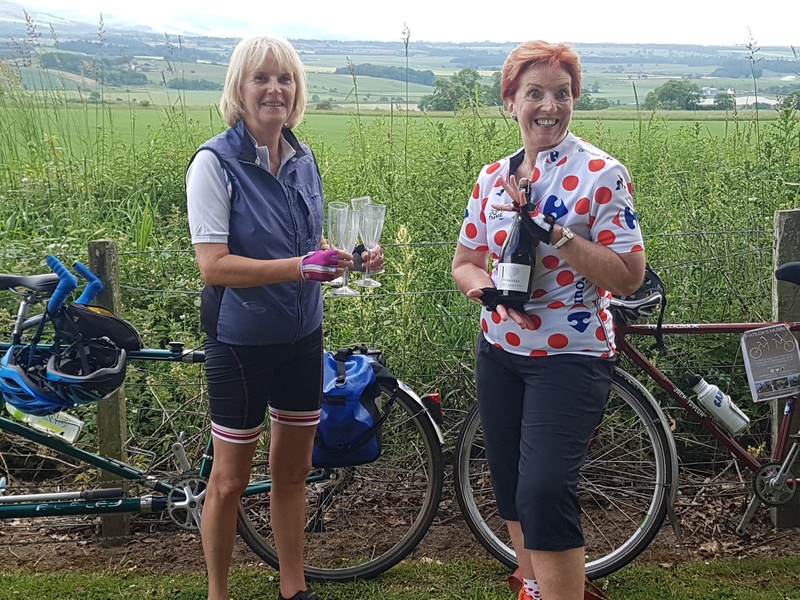 The detailed Strava figures showed my dynamic crew tandemed a distance of 38.5 miles with a moving time of 3 hours 32 minutes. The average speed was a healthy 10.9 while the elevation was 642 feet. 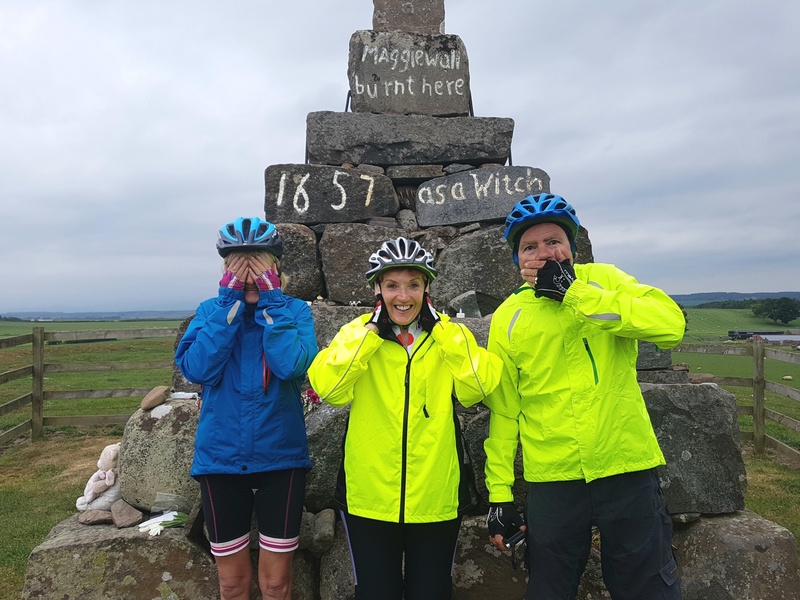 The maximum speed was 23.9 mph and Team Matilda managed to burn up 1552 calories and produce an average power output of 109 W.
All in all it was a much needed day out and escape for my dynamic crew – and was certainly action packed. 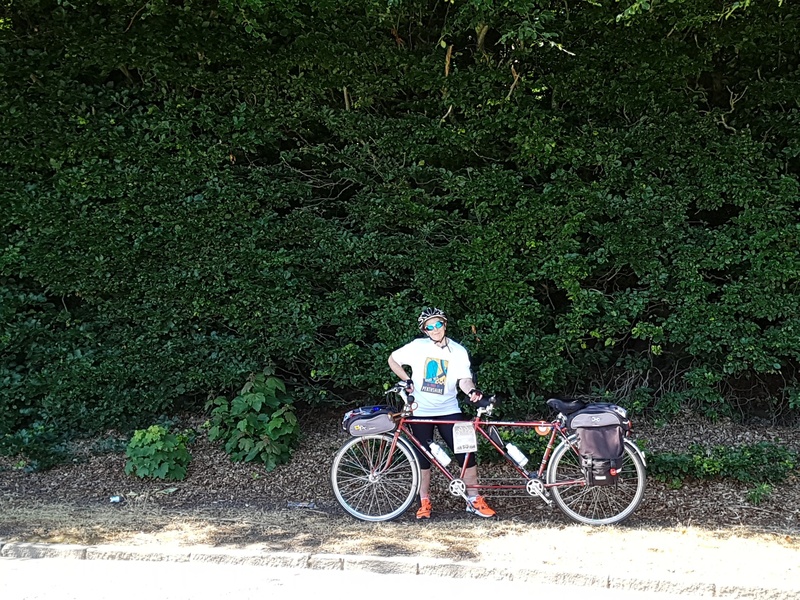 I really don’t think Team Matilda could have packed any more in … unless I become a Superhero bike of course! Now there’s an idea! …….. 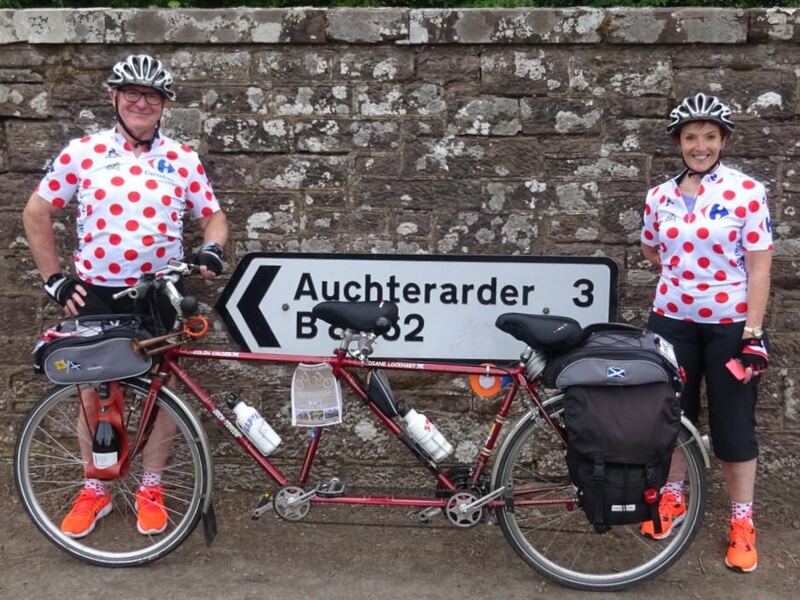 Very sadly the much anticipated Nutty Tandemers Club Hebridean Way challenge due to start early June has had to be postponed. This is due to the devastating recent news of the diagnosis of a sudden terminal illness to an immediate family member of my crew. We have been advised by the doctors in strong terms not to travel on our planned tour due to the immediacy of the situation. Naturally our world has been turned upside down – and this is clearly an extremely difficult time for us. We would hope to regroup and reschedule in the future.